Or so he says so in this first teaser trailer for the fifth installment of the megafranchise, Die Hard--It's a Good Day to Die Hard. Yeah, the title is a bit long. But it works. Haters can hate. 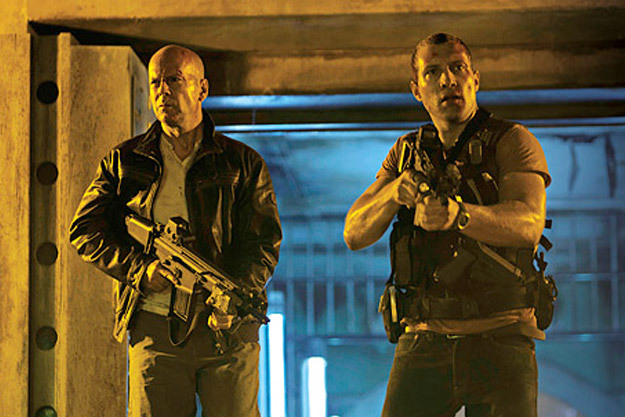 Iconoclastic, take-no-prisoners cop John McClane (Willis) for the first time finds himself on foreign soil after traveling to Moscow to help his wayward son Jack (Jai Courtney) — unaware that Jack is really a highly-trained CIA operative out to stop a nuclear weapons heist. With the Russian underworld in pursuit, and battling a countdown to war, the two McClanes discover their opposing methods make them unstoppable heroes. We already know Willis can handle this movie on his own, so it really comes down to this Courtney character, and the star quality he has. And after checking out Cortney's very brief resume of projects I've never seen (including TV's Spartacus), this could be a real toss-up. But Courtney does have Jack Reacher (alongside Tom Cruise) and I, Frankenstein (with Aaron Eckhart as the title character) coming up in the next year, which somewhat validates him. What is of great concern to me, however, is the fact that director John Moore is at the helm of this latest film. Moore, the same guy who did Flight of the Phoenix and the remake of The Omen. So....yeah. You be the judge. Chat among yourselves after you check out the trailer below. Meanwhile, I'm going to see about pre-sale tickets. It's a Good Day to Die Hard releases in theaters February 14th, 2013. Trailer is effective, hope the movie lives up to it! LOL Candice. I agree with you, until they really screw up I'm aboard the Die Hard train. I was not expecting the last sequel which I think had an even more ridiculous title (Live Free or Die Hard) to be any good, I thought LFODH's trailer was gotdamn ridiculous, but the movie was good! In any case for once on Valentine's Day we get something that's not a sappy romance story...I hope, LOL, so I'm there!